We encourage campers to use the most important art tool that they have to create great art – their imagination. The campers make art they can hang, they can wear, they can give as gifts, and art that shows off their name and who they are. They will even use food items to create edible masterpieces. A special art project is done every week to accompany the weekly theme. Each group has a scheduled art activity at least twice a week. Campers visit our state-of-the-art computer lab several times each week. Each camp room is also equipped with computers allowing students to continue their computer based projects when the lab is in use. Incorporates the popularity of the latest music video games, multi-media, and technology. Campers are also given an opportunity to showcase their individual skills during talent contests throughout camp. Campers are introduced to various genres of music beginning with 50’s & 60’s and ending with modern Rock and Rap. Each week at Color War, different music is played in accordance with the theme. We end the summer with individual groups performing camp songs which they wrote. Indoor and outdoor activities are specifically designed to promote good social judgment, following directions, increased attention, and ability to focus. The campers have scheduled activity sessions throughout the weeks, as well as, some sort of physical activity every day. Outdoor activities include traditional team sports such as basketball, kickball, dodgeball, volleyball, and soccer (to name a few). 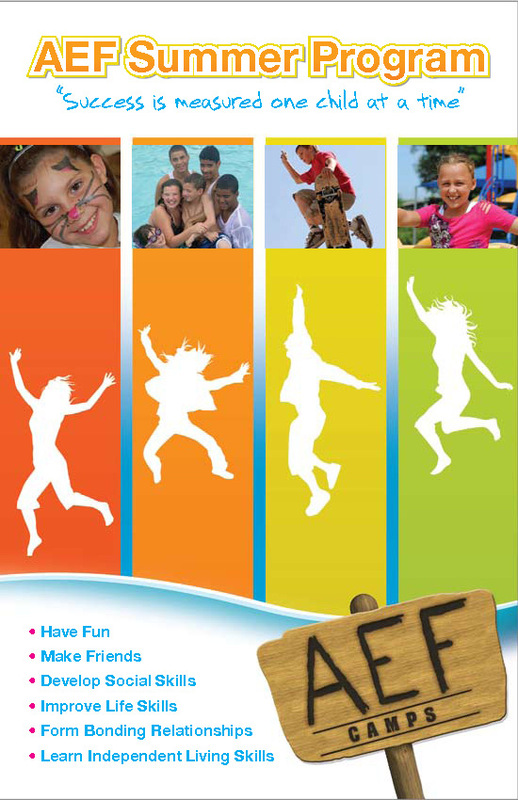 In addition to traditional games, AEF has developed proprietary in house games. These activities and games are completely new to our campers, change each year, and are designed to remove the advantage of experience and practice – giving every camper a chance to succeed. These sessions tap into the campers’ natural curiosities of exploring life’s mysteries while having fun. Campers focus on nature, magic tricks, kitchen chemistry, and physics. Example activities include blowing up a balloon with everyday items from the kitchen (baking soda and vinegar), making silly putty a.k.a. goop, cultivating a butterfly garden, and developing photographs using the sun. The campers play a variety of board games, computer games, card games, educational games, guessing games, logic games, lawn games, and table top games. Some of these games are commercial and some are created by our counselors. Campers swim several times per week at a local pool, beach, or water theme park. ** Campers enjoy free swim time while monitored by certified lifeguards as well as our counselors. ** All staff CPR and first aid trained. Campers have opportunities to earn points for their team every day through competition, sportsmanship, effort, and team spirit. Counselors keep a visual running score for each team in their camp room allowing campers to track their team’s progress. How to laugh at one’s self and have fun! Field trips are used as an opportunity to exercise social skills, make friends, and practice following directions.